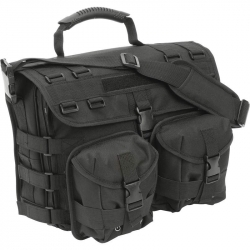 Features multiple zippered compartments, 3 interior compartments, a handgun holster, silver-tone hardware, webbing reinforced handles, and detachable shoulder strap. Measures 16-1/2' x 11' x 5'. Features multiple zippered compartments, locking telescopic trolley handle, inline skate wheels, double carrying straps, nylon construction, and black heavy-duty zipper-pulls. 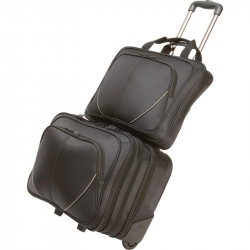 Business case measures 18-1/2' x 14-1/2' x 10', and two compartment laptop bag measures 18-1/2' x 13-1/2' x 3'. 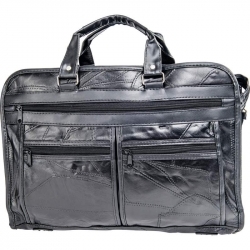 The Maxam(R) Brand Italian Mosaic(TM) Design Genuine Leather Briefcase keeps you organized during work, school, or client meetings. 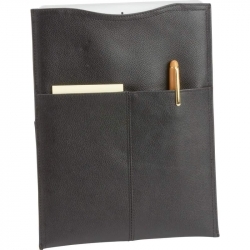 Ample room for your files, notebook, planner, notes, cell phone, pens and paper. The zippered top opens into 3 compartments and another zipper-secured pocket. Features exterior zippered pockets on both sides. Comfortable hand grips are trimmed with silver-tone hardware. 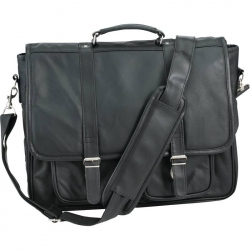 Briefcase can be shoulder carried by using the added detachable shoulder strap. Measures 16-1/2' x 11' x 5'. The Embassy(TM) 17' Packing Folder with Folding 'Form' makes quick work of folding fresh laundry, and your closet shelves and dresser drawers will look like professional clothing store displays. So quick and easy to use, there are no more excuses for leaving your clothes in the laundry basket or draping them over the bedroom furniture. Extend the life of your clothes and keep the bedroom neat and tidy. 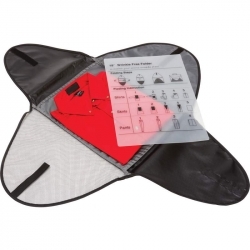 Packing folder includes instructions on how to use the form to fold clothing like a pro, and a 210d hexagon-check carrying case. Form measures 17' X 11-1/2'. Protect your tablet computer with subtle sophistication in this beautiful case. Features eyelet for camera, interior pocket, pen holder inside, interior security straps, and double zipper. Fits iPad(R) and iPad(R) 2. iPad(R) logo is a trademark of Apple Inc., registered in the U.S. and other countries. All other product names and images, trademarks, art, artist, and organization names are the property of their respective owners, which are unassociated and unaffiliated with Apple Inc. Measures 8-1/4' x 10-5/8' x 1'. Comfort and convenience are key with this workhorse. 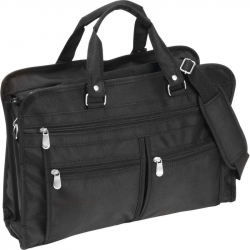 The Maxam(R) Nylon Expandable 16' Briefcase/Computer Bag offers multiple zippered compartments, including a padded laptop compartment. 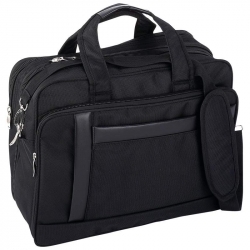 The removable shoulder strap and padded hand straps ensure your office on the go is ready whenever you are. Measures 16' x 12-1/2' x 7'. 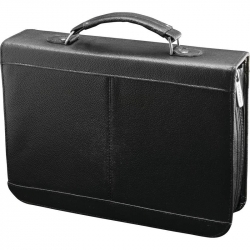 The Embassy(TM) Solid Genuine Leather Portfolio/Briefcase will keep you organized. 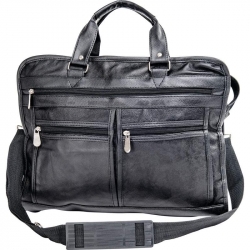 Constructed of genuine leather, bag features a zippered main compartment, multiple pockets with zippered closure, a padded hand strap, and an adjustable and detachable shoulder strap. Measures 16-1/2" x 13" x 3-1/2"
Your go-to professional bag! 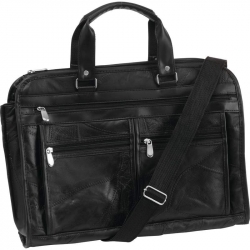 The Embassy(TM) Solid Genuine Leather Attach' Case is the perfect gear bag for work or school. Features roomy interior, saddlebag closure and multiple pockets to tote everything you need for the day. Under the flap is a large pocket for file folders or books and 2 smaller pockets. Also features removable, adjustable shoulder strap. Measures 14' x 11' x 5-1/2'. Features mesh and slip interior pockets; pen holder; interior security straps; exterior carrying handle; and zippered closure. Holds various computerized tablets 6' x 9' or smaller, plus electronic accessories. Measures 10-3/4' x 7-3/4' x 2-3/4'. Features 1 exterior pocket. 100% polyester lining. Measures 8' x 10-1/4'. Features durable 1680d construction, three exterior zippered pockets on front, zippered top compartment, heavy brushed silver-tone zipper pulls, color matched webbing, and removable padded shoulder strap. Measures 16-3/4' x 12' x 5'. The Embassy(TM) 19' Packing Folder with Folding 'Form' makes quick work of folding fresh laundry, and your closet shelves and dresser drawers will look like professional clothing store displays. So quick and easy to use, there are no more excuses for leaving your clothes in the laundry basket or draping them over the bedroom furniture. Extend the life of your clothes and keep the bedroom neat and tidy. 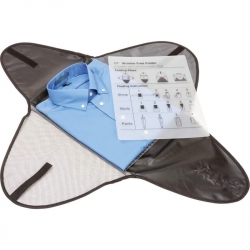 Packing folder includes instructions on how to use the form to fold clothing like a pro, and a 210d hexagon-check carrying case. Form measures 19' x 12-1/2'. Features heavy-duty 600d construction, corded zipper pull tabs, color matched webbing, padded shoulder strap, 2 exterior pouch compartments, exterior zippered compartment, 2 zippered main compartments, multiple interior slip pockets, and 1 laptop bag. Measures 11-3/4' x 8-3/4' x 4'.